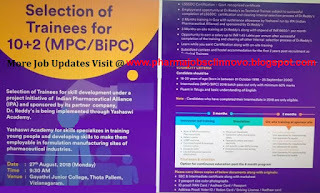 Greetings fromBiophore India Pharmaceuticals Pvt. 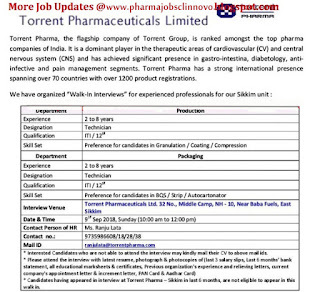 Ltd,Hyderabad . 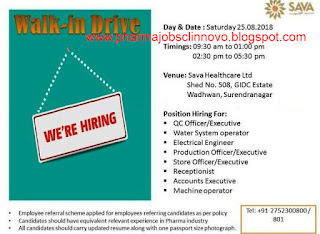 We have openings for the below Departments. 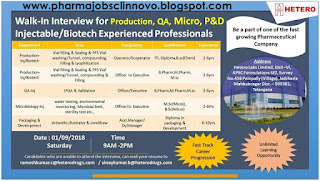 If you are interested please send your updated resume to careers@biophore.com ·Intellectual Property(IP)(Preferably Male) Experience: Fresher Qualification: M. Pharmacy (Pharmaceutical Chemistry / Medicinal chemistry / Pharmaceutics / Regulatory Affairs) 2017 & 18 Placement Location: Pashamylaram, Hyderabad. 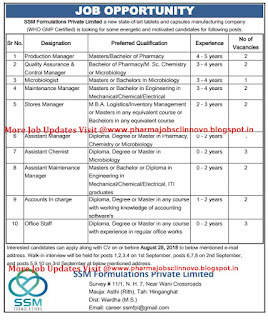 Experience: Fresher Qualification: M. Pharmacy (Any Stream) 2017 & 18 Placement Location: Pashamylaram, Hyderabad. 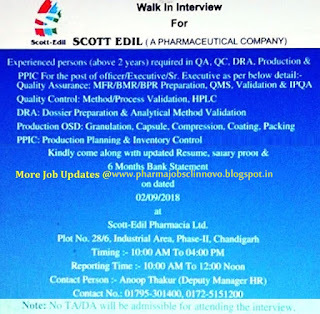 SSM Formulations Pvt. 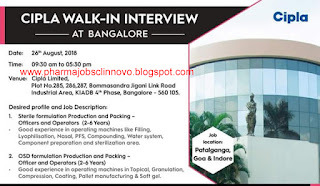 Ltd - Walk-In Interview for QA / Production / Microbiology / Maintenance / Store on 1st to 3rd September 2018. 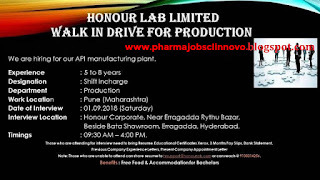 HONOUR LAB LIMITED - Walk-In Drive for Production on 1st September, 2018 @ Hyderabad - Clinnovo! 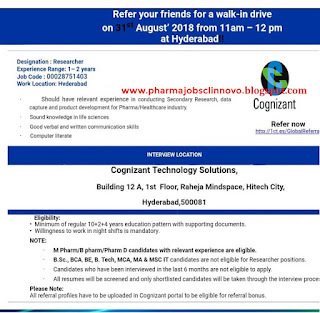 Cognizant - Walk-In Drive for B.Pharm / M.Pharm / Pharm.D Candidates on 31st August, 2018 @ Hyderabad - Clinnovo! 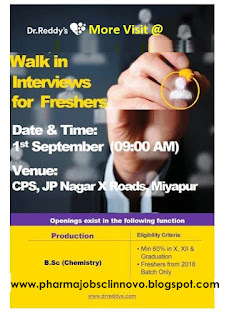 Cognizant - Walk-In Drive for B.Pharm / M.Pharm / Pharm.D Candidates on 31st August, 2018 @ Hyderabad. 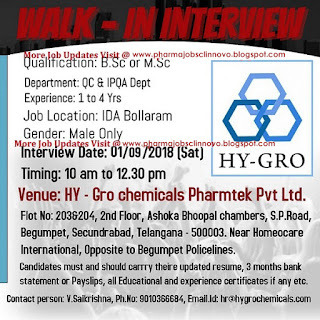 Paras Healthcare - Walk-In Interview for Pharmacist Positions on 30th Aug to 1st September 2018 @ Panchkula - Clinnovo! 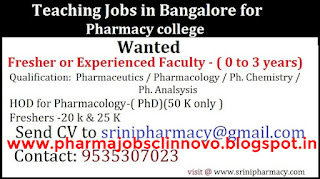 Srini Pharmacy College hiring for Teaching Jobs (Freshers & Experienced Faculty) @ Bangalore - Clinnovo. 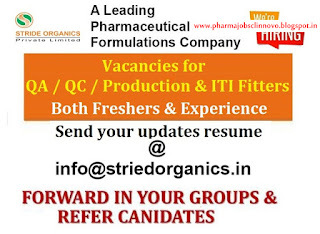 Stride Organic Pvt. 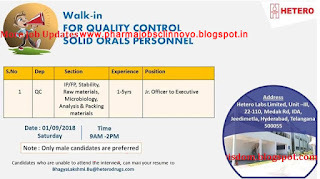 Ltd hiring for Freshers & Experienced Candidates for QA / QC / Production / ITI Fitters . 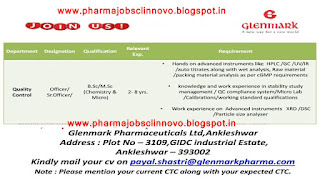 Glenmark Pharmaceuticals Ltd - Urgent Openings in Quality Control Department @ Ankleshwar - Clinnovo. 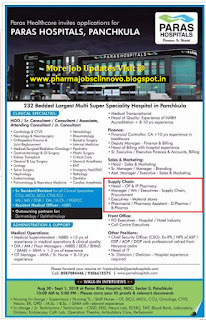 Hiring B.Pharm / M.Pharm Experienced Candidates for Scientist Position @ Navitas Life Sciences - By Clinnovo! 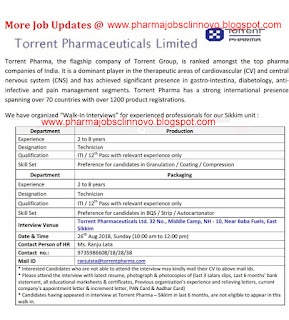 Navitas Life Sciences Hiring B.Pharm / M.Pharm Experienced Candidates for Scientist Position. 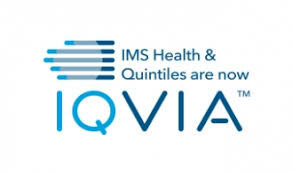 IQVIA - Walk-In Drive for FRESHERS & EXPERIENCED - PV Professional on 1st September 2018 @ Bangalore & Thane - Clinnovo! 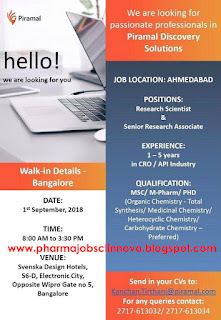 Piramal Looking for Research Scientist and Sr. Research Associate – Interview on 1 September 2018 @ Bangalore - Clinnovo! 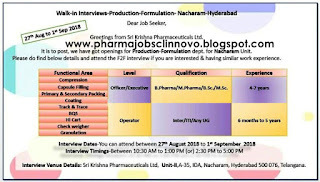 Sri Krishna pharmaceuticals Limited Walk-In Interview For Inter , ITI , B. Pharm , B. Sc Department Productions Formulation On 28th Aug to 1st Sep 2018 @ Hyderabad - Clinnovo! 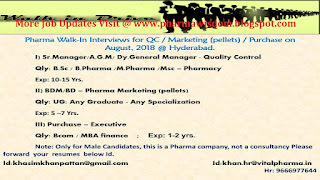 Vital Pharma – Walk-In Drive for QC, Marketing (Pellets), Purchase Departments @ Hyderabad - Clinnovo! 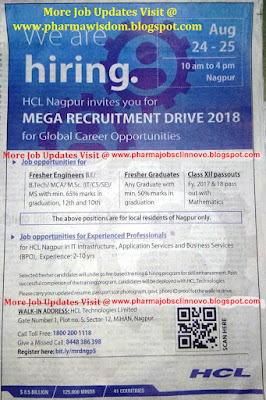 HCL MEGA RECRUITMENT DRIVE on 24th – 25th Aug, 2018 for Freshers & Experienced Graduates @ Nagpur - Clinnovo! 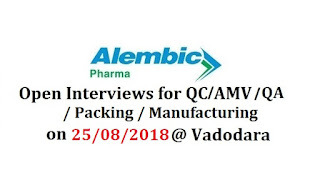 AlembicPharmaceuticals is looking for competent personnel to be an integral part of our Quality team for our new Formulation plants based at Panelav in Vadodara, Gujarat.